Curtain systems are an integral part of climate control for many greenhouse growers, yet there are still numerous greenhouses not using this valuable tool effectively, or even at all. The main function of greenhouse curtains are shading and energy savings, however a good curtain can be valuable for controlling the greenhouse environment in other ways as well. Proper climate control is the result of integrating various systems, and no addition to your greenhouse should be addressed in isolation. So make sure your greenhouse heating and cooling systems are working in conjunction with your curtain systems. Close-up view of greenhouse curtains. This one is a bit of a no brainer. If you don’t have curtains now you are obviously not getting the most out of them. While glass greenhouses almost always have good shade and energy curtains, poly greenhouse growers have been slower to adopt climate screens in their structures. The payback can still be substantial, so if you haven’t looked at curtains recently, now is a good time to call us. Just like irrigation, ventilation, and supplemental crop lighting, shade and heat retention curtains, and blackout curtains, should be controlled by a central environmental computer in order to maintain the optimum environment for your plants. Consider that curtains affect light, airflow, temperature, and humidity. That is a lot for a grower to consider in a manual or semi-manual operation. Automating curtains is significantly easier and dramatically improves the greenhouse crop environment. Some curtain screens, like New Harmony climate screens by Svensson are high light diffusion screens that scatter sunlight more evenly through the greenhouse. This helps eliminates shadows and provides better coverage of the canopy. It also enables the light to penetrate deeper into the crop. Diffused light treatment of glass and curtain systems has enabled healthy plants to be grown more densely, which means more crops under the same square footage, and more profit to the grower. With fire rated fabric screens, some greenhouses have seen a reduction in insurance premiums after installing climate control curtains in the greenhouse. Let’s face it: fire rated fabric has real value in reducing your risk of fire damage; if you can get additional savings, that’s a bonus worth exploring. Blackout curtains being used in a greenhouse. Humidity management is a valuable tool to prevent diseases in greenhouses. By closing or opening your curtain system you can increase or decrease humidity levels. Closing a curtain traps more moisture allowing humidity when needed, while opening the curtain even in small increments will help mix the colder air from above the curtain with the warmer air below to enable humidity levels to drop. The best results are achieved through incremental movement of the curtains, which help even out changes in the greenhouse environment and therefore provide a more consistent atmosphere for the plants to grow in their preferred climate. Just as with shade and energy curtains, blackout curtains can be used to affect the greenhouse environment in more ways than just light levels. Several years ago, Michigan State University conducted a detailed experiment to quantify how different greenhouse curtains influenced shoot-tip temperature while keeping the greenhouse ambient temperature the same. The results showed shoot-tip temperature was warmest under blackout curtains. In a blackout system the grower is almost always using a rollup curtain, but even without blackout, rollup sides and ends can provide shading and insulation value that helps keep the perimeter crops healthy. In a gutter connected greenhouse finding ways to improve the environment for perimeter crops can yield positive returns. Sales manager Michael Camplin measuring light levels. If you are growing commercial crops, then light really matters. If you have invested in a proper greenhouse curtain it makes sense to have a proper light meter to obtain actual measurements of the light environment inside your greenhouse. The same goes for humidity and temperature. Today’s sensor technology enables a high tech greenhouse to take immediate action based on computerized decisions that are impossible for human judgement. Remember curtains affect your crops’ light levels, temperatures, and humidity so there may be a value tradeoff in reducing light levels at times in order to keep temperature down or boost humidity in the greenhouse for crops that love more moisture in the air. A significant benefit of greenhouse shading can be in reducing the plants’ needs for water uptake. As water regulations and drought controls spread it is the progressive grower who is looking for ways to obtain maximum value from water resources. 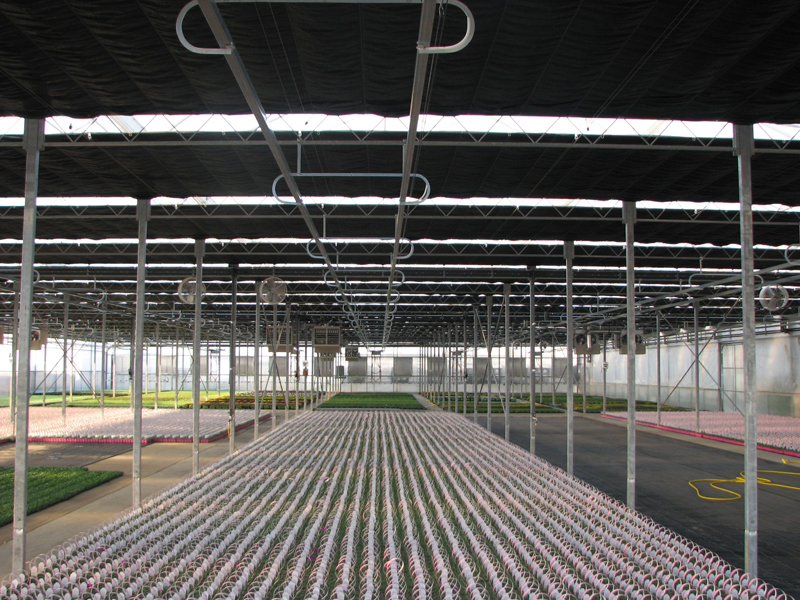 Greenhouse shade curtains can be a tool for helping achieve lower water consumption, just make sure that your irrigation timing is working in conjunction with shading. Open blackout curtains in a greenhouse. Your plants are not the only ones who need a break from the heat. 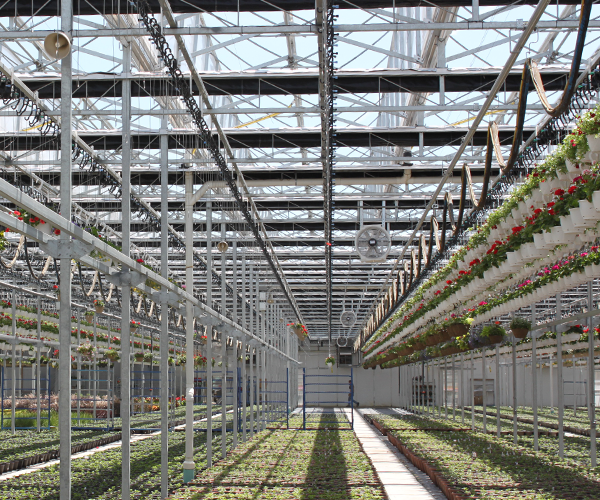 Greenhouse workers are happier and more productive in a comfortable environment. 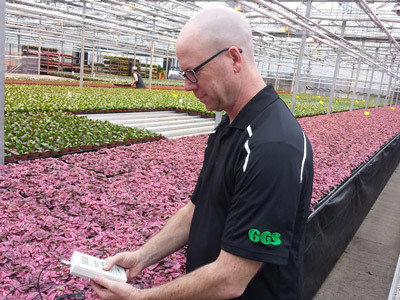 Greenhouse areas that do not need shading for the crop’s benefit can also provide a valuable return in employee benefits. Dust can and will accumulate on shade curtains over time, and this will reduce the light levels that get down to your crop. Ensure your screens are cleaned as part of a regular maintenance schedule. Additionally, watch for snags, loose or broken wires, and bundles that are just not as tight. Just like any mechanical system, curtains cannot operate at their best if they are not kept in good condition. Most greenhouse operations with curtains are using them to increase temperature levels and expending less energy for heating. But not all greenhouses are timing their curtains to begin opening and closing slightly before needed. 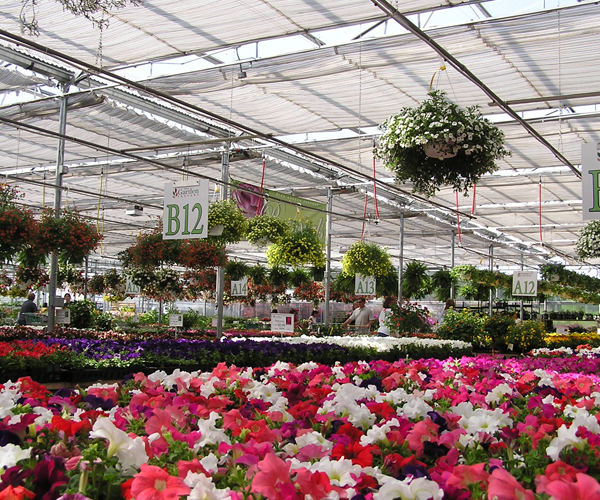 By properly timing when curtains move a greenhouse grower can significantly reduce the temperature fluctuations inside the greenhouse that occur as outside environmental conditions change. In general you want to begin closing your curtains before sunset, and open them just after sunrise. The exact moment of opening and closing varies with the solar radiation level. In many parts of the US, Canada, and Europe energy grants are available to encourage investment in efficient equipment, systems, and processes. Shade and energy curtains can be considered for grants that touch on water reduction, natural gas reductions, and electricity savings. If you are considering putting in a new curtain, or even improving upon your existing system, it is worth spending a few hours to explore what funding options may be available to you. Greenhouse curtains used in a retail space. There is a wide spectrum of shade levels available in addition to choosing between open weaves and closed weaves, and then there are features like light diffusion, energy savings, or blackout. The crop environment, greenhouse style, the climate of your geographic region, and how the curtain will operate all factor into choosing the right fabric to maximize value of your climate screen. As more greenhouses are adding supplemental lighting to increase daytime hours, and as urban sprawl and farm to table movements have brought greenhouses closer to residential homes, greenhouse curtains can be used to help keep lights from disturbing your neighbors. So at night, make sure your curtains are closed. Two curtains are better than one. A double curtain system increases your ability to benefit from different curtain fabrics, like light diffusion and energy savings. It enables you to have less shade with one curtain closed, more with the other closed, and more still when both curtains are closed. This helps the greenhouse grower maintain consistent shading at the right levels for the crop. 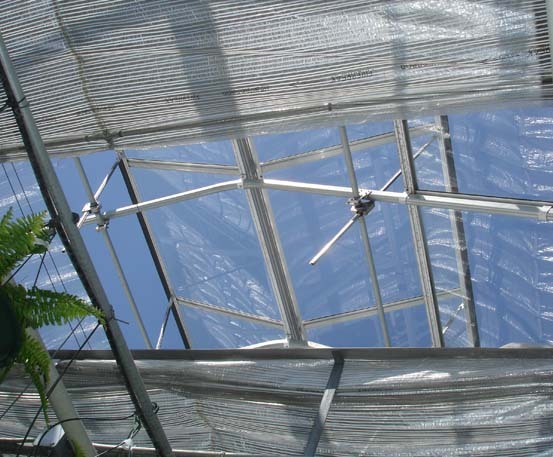 Double screening in a greenhouse also improves natural ventilation in the greenhouse when curtains are fully closed because the gap between the two layers lets air from below the curtains escape through open roof vents. Bonus Tip: While all the benefits for improving your greenhouse environment with shade and energy curtains are exciting, and labor, irrigation, and energy savings can be enticing, be careful you don’t fall into the trap of using your greenhouse curtain too much. The goal of integrated systems in a greenhouse is to provide the best environment for the plants. Over using the curtains to the point of excess shade could hurt your plants’ growth.